This once clear tributary to the Wisconsin River now carries tons of soil from croplands on ridges and slopes. Silver maples, willows and box elders grow on the soil deposited by erosion. The low peaty meadows on both sides of the creek serve as a sponge by trapping silt and providing a steady supply of cleaner water to the creek, enabling some trout to survive. Springtime brings a gala display as the yellow marsh marigold and blue flags bloom to a chorus of frogs and toads amid the humps of grass-like tussock sedges. During the summer the meadow is a favorite nesting spot for many small song birds such as the marsh wren and song sparrow. In contrast to the planted acreage across the road, the diverse lowland plants here provide a variety of cover and food for deer, pheasants and many butterflies. Maintaining remaining wetland areas such as this one is a key to preserving our native wildlife. An interesting tall plant found here and farther up Highway JJ is the teasel. Its thistle-like heads have been used for centuries to comb wool fibers. Perhaps a fuller once lived near here -- a person whose profession was cleaning and thickening fabrics. 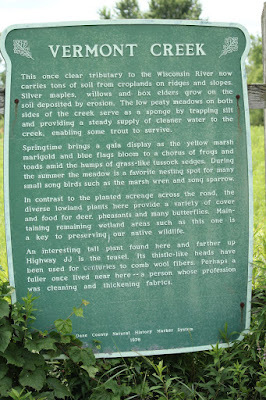 The marker is located on eastbound County Road JJ, west of its intersection with State Highway 78, Black Earch, Wisconsin 53515. Looking west along County Highway JJ . . . Looking east along County Highway JJ.